He would make us sit and draw a list of the Durga Puja pandals he would take us to on his Lambretta scooter. Three kids at a time. He would guide us through the crowds making sure we reached a spot close enough in the pandal to have a good view of Ma Durga. Some of us who were not tall enough would get lifted in his arms as the child would clasp his or her hands in a pranam before he was brought down and the next kid hoisted up. I am holding the same man’s hand as I guide him through the crowds and through the bright lights which now blind him. I take him to a place as close as possible to Ma Durga where he does his pranam and then we slowly walk back home. 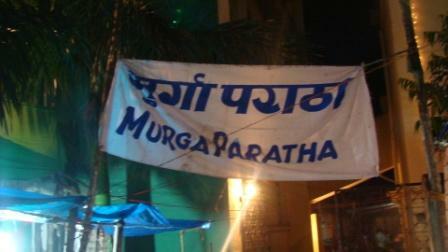 This is the only pandal he visits this puja. He seems to have aged dramatically. A stoop, an uncertainty in his voice, a tentativeness in his gestures, none of these existed earlier. A confirmed loss of vision in one eye, the other teetering perilously close to blindness, a newly acquired pair of hearing aids (after much persuasion by his children) the body debilitated by a sudden hospitalization (his first ever hospital stay in 84 years of his life). My eyes shed a tear as I held his hand even more firmly, feelingly fiercely protective about him. My father, Pitaji, has aged over the three months since I last met him when he visited us at Bangalore. Here she is, fighting about the colour of sari which her daughter-in-law has gifted her for the pujas. Makes me look too old she says. Her daughter-in-law cannot not convince her otherwise. She repeatedly confuses between her two grandsons, calling one by the name of the other. She insists on serving her son a second helping of sweets, day-after-day, meal-after meal. She forgets, despite repeated reminders from her son that sugar is not advised for him anymore. She goes on repeating what she has said just moments earlier. Like; brush your teeth, have your tea, comb your hair, have your meal. Mundane stuff like that. She yells like a kid when her husband is being taken to an eye doctor to get the status of his functioning eye. She says, that was an over-indulgence bestowed to him, it is she who needs to have her eye examined. The eye which has been diagnosed at Sankara Nethralaya, Chennai, a few years ago as having been completely damaged and irrecoverable unless a corneal transplant is done. Dementia is eating into my mother’s, Mai’s, short-term memory cells, she is now living her second childhood. I discover him slumped on his chair as he is reciting Durga Path during Navratri. I summon my wife, and she is equally worried. What has happened, we wonder. And then a quick shout from me and he wakes up with a start. And he renews his reading. This is the first time I see him sitting on a chair in the Puja Room. And fall sleep during his Puja. Thank God, we say to ourselves, he is alive. I see her hobbling across the house chasing the newly appointed (by my wife) maidservant. The hobble accentuated over the years due to worsening arthritis. She does not let go of the maid and it requires my wife’s intervention to get issues resolved. She is on her feet the entire day. Arguing, fighting, sulking. Reminding my father of all his follies as a husband over the past 60 odd years of their married life. Father bears it, with a smile on his face! And then at 9 pm, the day shuts off for her. She is not to be heard at all. I hunt worriedly for her. And then I find her on her bed, snoring away. The snores are so reassuring, Mai is still alive! Pitaji turns 84 in the next few months, mai, 79. They stay by themselves in Jamshedpur, their six children living across the country. While they visit their children round-the-year across geographies, they insist on staying back at Jamshedpur. Just the two of them, together. Sharing a togetherness they have never felt before when they raised their children. They are very happy together, despite all the bickerings. Maybe the loss of vision and hearing has aided this togetherness! I want to urge them to move in with us at Bangalore. As I am sure my other siblings too have wished they stay with them. The signs of aging are so discernible, on both. And suddenly I am haunted by the thought of death. I do not know which of the two God will summon first. And I do not look forward to the day. I do not, at all. 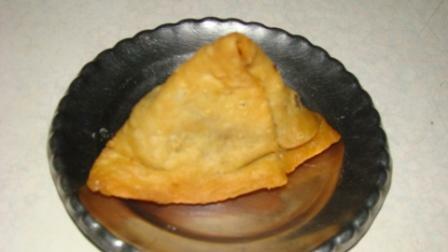 Jamshedpur is not known outside the city as a haven for foodies. Most visitors would remember only the slag dumps and the silhouettes of the Tata Company (Tata Steel factory). 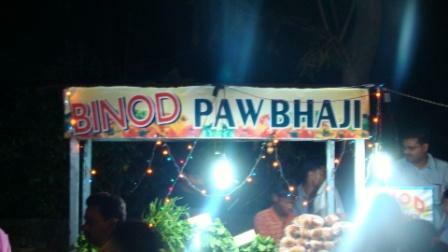 Unless they have tried the Jamshedpur street food. There is the famous city landmark, “Fakira Chanachur”. Such is the allure of this heavenly chanachur that once a business acquaintance of mine in Bangalore (who also happened to be from Jamshedpur) swore to do my bidding if I only got the person concerned a packet of this heavenly “mixture” when the deed was done. Needless to say, I succeeded. The spiciest and tangiest of the chanachurs you can ever get to eat. This has been the signature stuff of the steel city ever since I was a kid! There are other famous food joints as well. Including a new chanachur vendor in Sakchi I have not visited yet. There is Manohar Maharaj Sweets, Bhola Maharaj Sweets, Narayan Kulfi, Roopali, the milkshake joint at Kamani center, and so many more! My favorite from my growing up days in Sonari, Bombay Tea House (BTH) at Kagalnagar market, has now been converted to a chemist shop! Alas! Instead of keeping youngsters in the para happy with their chai and singhara (and an odd kalakand if one felt rich), they now cater to those medically challenged! Maybe BTH lost its business to the “hotel” a few meters away next to our house (at ‘D’ Road corner) which serves the most gorgeous singharas! During the recent Puja vacations, my kids would promptly park themselves at the joint at 4 in the evening and await the freshest, crispiest and the tastiest singharas. Just Rs 2 for one. What I delight it was to be woken up by kids after an afternoon slumber and have singharas with hot tea at home! Here is a pic of a D-Road singhara (the joint does not have any other name!). Unfortunately, this is too glamorous (and unfair) diplay of the singhara. I do not have a pic of the singharas in their “thonga”! To my mind, the Jamshedpur dosa is one to die for. Specially off the mobile dosa vendors who wheel their carts around the streets in the evenings doing thak-thakk on their dosa tawas all the time. I have written about them in one of my earliest posts; either Street Calls 1 or Street Calls 2. 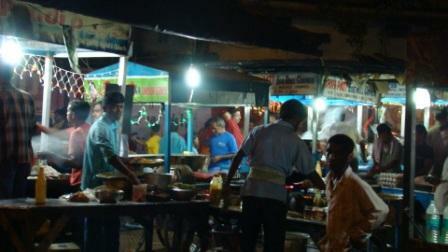 And then the landmark outdoor eating joints near the Muslim library at Bishtupur. Off the lane next to the Regal Building. A host of 20-25 stall, all serving similar fare. Essentially rolls and chowmein in various avatars. You may park you car off the road, order at the stall and await the order to be served at your car. Or you could stand at the stall and devour the heavenly stuff. We decided to have our order served to us as were seated in the car and there came a grubby kid carrying plates of stainless steel with out chosen stuff. With tons of watery ketchup. He even brought to us bottles of water and paper napkins to our car. 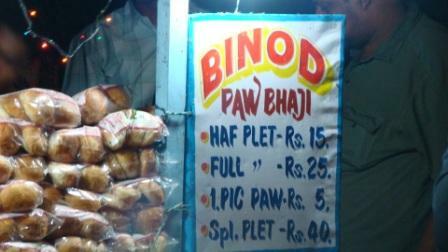 While at Bishtupur, how can you not visit the latest (by my reckoning) in street foods. The lane opposite the D.M. Madan School has a host of vendors. And each stall is as crowded as the other. 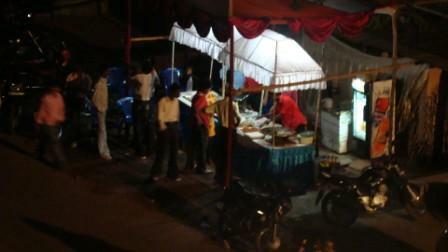 We were first led to this litti stall by our hosts. 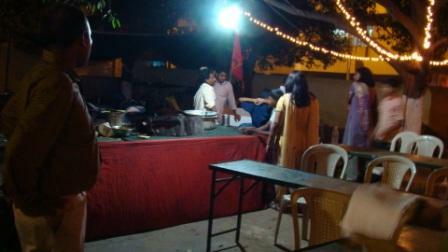 The litti “chef” here has apparently done the honors for the wedding of one of Laloo Yadav’s offsprings. I personally thought the litti was average. By the way, if you have not had litti before, you must try it. 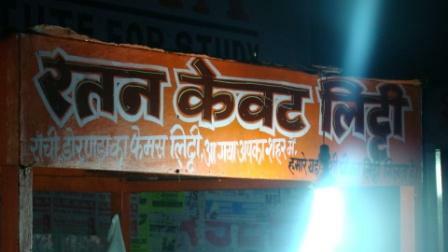 This is the Bhojpuri region’s rejoinder to both hamburger and Pizza, together! 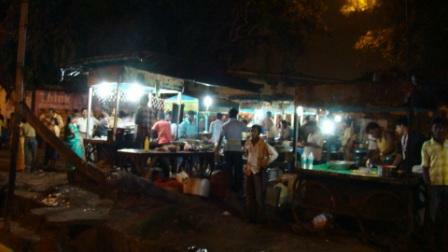 Next to that was an attractive looking (and horribly crowded) dosa stall. Unfortunately, my wife was served a burnt dosa. The dosa-maker, in the best traditions of French master Chefs, refused to admit the obvoious that the dosa was really burnt and refused to replace it with a fresh, evenly cooked one. * Wife throwing away the dosa plate. * Dosa-maker protesting angrily at this “slight”. * Host-in-chief threatening retribution for this rank-bad customer service. * All of us moving away to the next stall. Prefer one Pic. Paw or Haf Plet? This piece of mine is a fan’s tribute to Madhushala, one of the most popular works of poetry ever written in Hindi. Madhushala, one of those rare works which gained both critical acclaim and popularity, was written by Harivansh Rai Bachchan way back in 1935, 73 years ago. And he just 28 years old then. Madhushala, on a superficial level, can be mistaken as a tribute to Bacchus, a celebration of liquor. In fact, most early readers fell into this trap. The literati was initially very critical of him, they thought he was extolling the virtues of drinking. The controversy abated after some time and even the great poets of the day conceded the greatness of this masterpiece. The Madhushala means a tavern, and it repeatedly mentions the joyous pleasures of saaki (bar woman), pyaala (goblet), and the tavern. But a discerning person would soon realize that this is a celebration of the joy of life. Joy in its purest form. Life devoid of dogma, make-believe, and orthodoxies. Madhushala is written in the rubaii form, a form of Arabic poetry. There are 135 rubaiis and this album has a selection of them which capture the essence of the work. This piece of mine is largely based on the Madhushala album sung by Manna Dey to music composed by Jaidev. It was released some 40 years ago. My first recollection of Madhushala is listening to it on the new Bush “Stereo System” bought by my eldest sister some 35 years ago. She had bought LPs of Manna Dey’s Madhushala and Mukesh’ 5 –volume Ramcharitmanas to go with her new music system. I was a kid then and I did not understand much of what was sung. Since then I have been through cassettes and CDs of Madhushala, losing most of my purchases to friends to whom I played Madhushala to. They all wanted to get hold of the music, and my cassette or CD was their simplest target. I now have only a cassette of Madhushala. From LP to CD, I have been through the entire gamut over the last 35 years. And let me tell you, I still cannot get over the phenomenon of this music. I have been an unabashed fan of the album, and I believe I have managed to get many of my friends to like it as well. This album opens with the seductive cries of a been and then the dilemma of the narrator who in his quest of a Madhushala reaches a cross-road and wonders which path to take. Different people advise differently. Someone then intervenes and advises him to select a specific path to the Madhushala. This opening stanza of the album is in the sonorous voice of Harivansh Rai Bachchan himself. I am told Bachchan’s recitation of Madhushala was a rage in the kavi sammelans he participated in! Such is the poetry and such was his voice, he was catapulted to popularity among the masses which thronged to listen to him. My father, who is 84 years old now, recounts the time when he walked all the way to a program a few miles away from his village to hear Bachchan who was rumored to recite Madhushala there. My father still regrets the poet did not turn up for the program and the fact that he could never hear him live. And this was sometime in the early 1940’s. After this stanza by the poet himself, Manna Dey takes over. The magic web gets thrown on the listener! Over the next few stanzas you are taken through the gamut of emotions felt by the protagonist. His reflections on life conveyed through the emotions he expresses via the interplay of liquor, goblet, barmaid and the bar. The mysteries of life, relationships, societal norms, organized religion, death, after-life are all expressed via these symbols. Side A of the cassette is joyous while the side B turns introspective, somber really. But what is not lost is the ode to that elixir which gives life its joy, its meaning. Whatever life has to offer me, I take it as sheer ecstacy. Such is the joy which life has to offer to me. To my inner eye, the world is a large tavern. Who are rid of the trappings of all faiths. And have a tavern indulge them. I shall not try to translate this one! By now you can guess how the protagonist wishes to be appeased once he is dead! If you have heard Madhushala or read it before, you have been as lucky as I have been. And if you have not, please do get hold of a copy of the album. CDs and cassettes are available freely. And if you want to read the text as well (the full text), Hind Pocket Books has a nice edition available even at a good A.H. Wheeler bookstall. The level of Hindi is slightly higher than Std X levels as you would have guessed by now. But do give yourself up to the joys of this work, the meaning will follow itself! Go ahead, enjoy this vigorous- and loving- tribute to the goodness of life! You are currently browsing the Santosh Ojha's Weblog blog archives for November, 2008.